3. Turn the heat up to medium high and stir in the rice - keep stirring for about 2-3 minutes. Add the wine & lemon juice, and stir until it has been absorbed. Turn the heat back down to medium. 4. Start to add the stock about 1-2 ladlefuls at a time (should just cover the rice). Cook, stirring often until the rice has absorbed the stock- then add more broth. Continue this process until the rice is tender. Add the peas and chopped artichoke hearts when you are down to the last few ladle-fuls. The entire process should take about 25-30 minutes. You may or may not need to use all of the stock (I used all 7 cups). Season with salt and pepper. 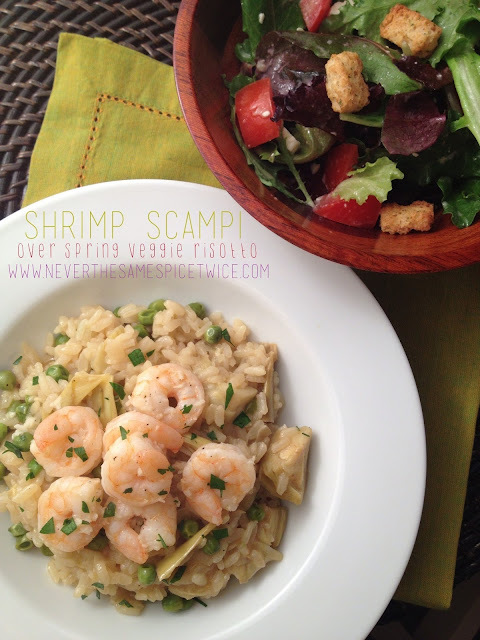 Top with shrimp scampi (recipe below), and parsley - serve! 1. In a large pan over medium heat - melt butter, and heat olive oil. 3. Add white wine, and lemon juice - stirring often until the liquid begins to reduce, and shrimp turns pink. Add pepper to taste.